Finding nerdy references or themes in metal isn't hard- for plenty of bands, that is their entire catalogue. Others, it's slightly more subtle. 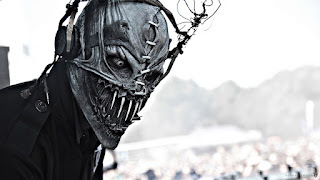 Mushroomhead- one of my favorite bands ever- peppers their music with references, including the one above. Their videos are basically horror movies (and they are all huge horror fans). And, of course, the whole fortythree thing that everyone's* favorite SciFi author uses comes from Mushroomhead. Fun, nerdy side note: The band is from the same suburb of Cleveland that most of my family is (the oft-referenced 216), so I have seen them several times when I have gone back. After one show, I ended up hanging out with Rick/Stitch (pictured), their DJ, and we were talking about the samples he uses. "Who do you use when you need some creepy kids voice?" "I just grab one of the band members kids and ask them what Star Wars action figure they want, and buy it for them if they say something creepy." I wonder if Kubrick bribed the twins in the shining with nerdy toys. Your mixtape this weekend has two sides- Side A is the more chill, if your Friday involves hanging out at home, and maybe writing (the romantic life of a writer- home on Friday night!). Side B is for if you have a little more excitement planned. Feel free to use it as an interlude for the whiskey-fueled horror movie marathon that it would pair so well with.